Copyright © 2013 Hossein Vaezy, Vahid Tabataba Vakili. This is an open access article distributed under the Creative Commons Attribution License, which permits unrestricted use, distribution, and reproduction in any medium, provided the original work is properly cited. 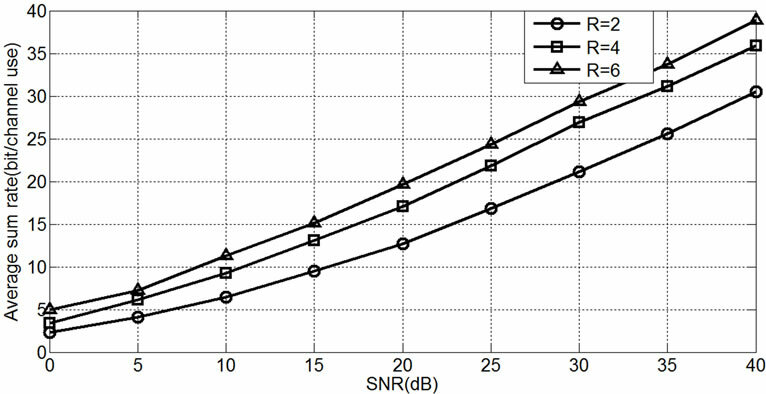 where is sum capacity as a function of Signal to Noise Ratio (SNR). Also, is approximation error. At high SNR regime, the second term becomes negligible in comparison to first term. 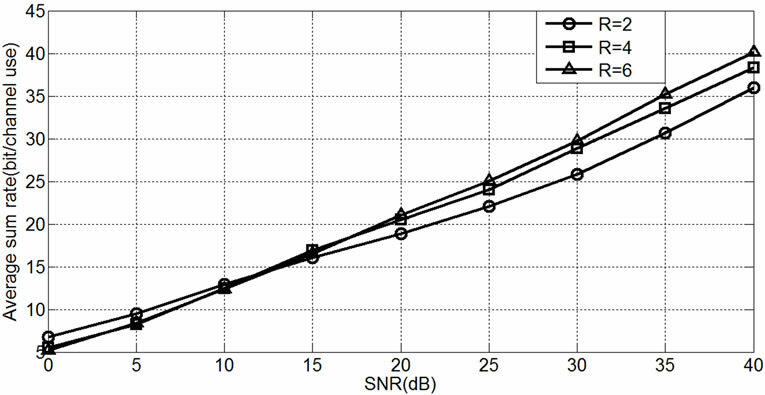 The main result implies that at high SNR regime, each user in wireless channels is able to achieve one half of capacity regardless of user number in the absence of interference. IA approach in wireless channels refers to idea that constructed signals in a way that interference signals overlapped in one half of the space and the other half was free from interference [5,6]. This result is much interesting, since sum of the used resources for the whole network can become much larger than available resources. Accordingly, it is necessary to fit the undesired signals from different users into a small space. In , authors utilize channel variation properties to perform IA by extending the signals over multiple time intervals. By using time extension, the authors show that a DOF of M/2 is possible for M-user IC. 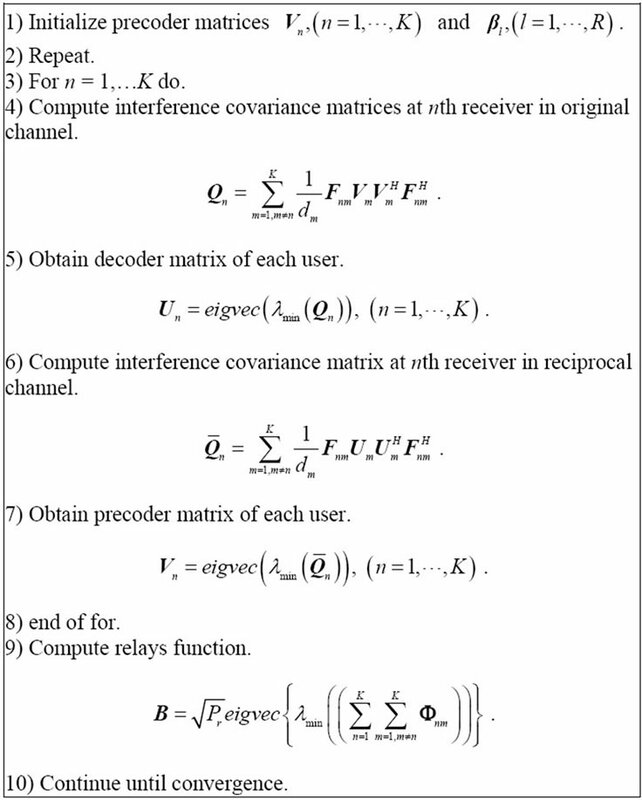 In the other side, a distributed algorithm for achieving IA with multiple antenna nodes is presented in  that utilize reciprocity property of wireless channels. They observed that IA without symbols extension is infeasible in special cases and showed that IA without symbols extension can be achieved by using relay. 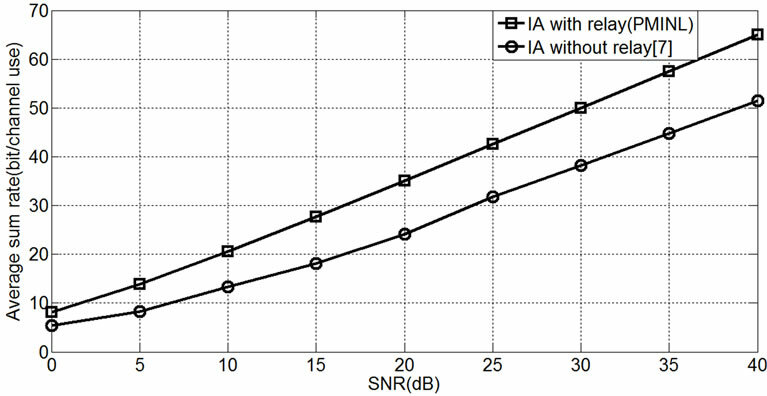 Feasibility conditions for IA were analyzed in , it considers IA as multivariate polynomial system and proved that due to the number of equations are larger than number of variables, without symbols extension the wireless interference network is unable to achieve IA. Ref  shows that half duplex Amplify and Forward (AF) relays are unable to increase DOF of interference networks but can help to do IA with limited symbols extension. It indicates that if number of relays is sufficiently large DOF of interference channel can reach DOF of X channel . Relay aided IA is considered for quasi static X channel . Interference channel with K users compeer to K layers of half duplex AF relays are considered in . It is shown that K DOF is achieved when the number of relays is almost K (K − 1). Theory of irrational independence of numbers rather than linear independence of rational vectors is introduced in  and showed that maximum DOF of interference channels is achievable. Realizing this theory in realistic scenarios is still an open problem because nodes need to know channel state Information (CSI) completely and determine that channel gains are rational or irrational. K users IC with half duplex AF relays is analysed in . It considers direct link from source to destination and suppose that each relay allot to a receiver. In  K users IC with half Duplex AF relays is considered and for IA attempts to fix precoders and decoders in order to design relays so interferences from direct links are negated with interferences from relays. In this paper, K users IC compeer to full duplex AF relays are considered that each of nodes equipped with multiple antennas and the direct links from sources to destinations are ignored. 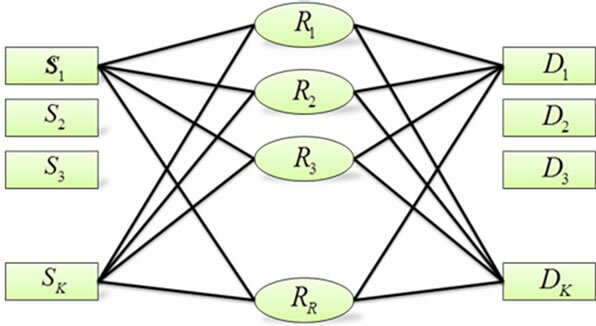 Two iteratively new algorithms are proposed for computing relays function, precoder, and decoder matrices. Leakage interferences at receivers are minimized in first algorithms. This algorithm diminishes interference at receivers but do not attempt to improve power of desired signals in receiver. In the second algorithm, Signal to Interference plus Noise Ratio (SINR) is maximized by designing precoders and decoders matrix and interferences are diminished by relays. This algorithm has better performance at low to mediate SNR regime. Simulation results are validated in terms of average sum rate and show that two algorithms have same performance at high SNR regime. The rest of this paper is organized as follows: Section II provides an introduction to the system model of the MIMO interference channel based on interference alignment. In Section III, we discuss the precoder, decoder, and relay function design for system. Section IV presents the simulation results. Finally, concluding remarks are given in Section V.
Notation: for a matrix , , and indicates the transpose and hermitian transpose of , respectively and is the column vector consisting of all the columns of . Also shows maximum eigenvalue of matrix . For matrices and , indicates the kronecker product of two matrices. denotes identity matrix of size . 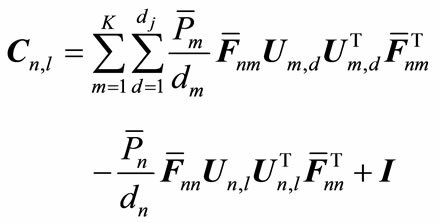 The notation of means that is complex Gaussian distribution with mean vector and covariance matrix . In this paper, a Multiple Input Multiple Output (MIMO) interference channel with relays is considered as is shown in Figure 1. We indicate each of the mth transmitters, nth receivers and lth relay nodes with , , and , respectively. where are dm independent coded data streams transmitted from and normalized in the form of . indicates linear precoder in and denotes circularly symmetric complex additive Gaussian noise in relay with zero mean and unit variance. where denotes circularly symmetric complex additive Gaussian noise in destination with zero mean and unit variance. where shows suppression vectors in destination nodes . The condition (7) guarantees that interferences are aligned and can be omitted with suppression vector in nth destination. The condition (8) guarantees that nth receiver can decode data streams successfully. Then, interference alignment is feasible for a given tuple DOF . In the next section, we propose two new algorithms for interference alignment with relay. Simulation results show advantage of each algorithm. In this section we present iterative algorithms for IA for given tuple DOF . In this section we present an iterative solution for above optimization problem. So, we optimize problem in three steps, in each step we fix two parameters and design third parameter and continue process when the algorithm converges to constant parameters. So that is equal to covariance matrix of interference at nth receiver. It can easily be seen that is equal to eigenvectors equivalent by minimum eigenvalues of . The minimum value of leakage interference at nth receiver is equal to summation of minimum eigenvalues of . Step 2: design precoder matrix , with fixed and . The Property that is used here is the reciprocity of original and reciprocal channel . Alignment conditions for original channel and reciprocal channel are equal. If the tuple DOF of users be achievable for original channel then the same tuple DOF is achievable for reciprocal channel. In other words, in reciprocal channel each user design its interference suppression matrix that is precoder matrix for other user in original channel and this make the problem to be altruistic. Therefore, each user in the network attempts to minimize interference for other users and thereby enhance the throughput of total network. We design precoder matrix by solving following optimization problem that minimize leakage interference in reciprocal network. where is covariance matrix of interference and is leakage interference in mth receiver in reciprocal network. It can easily be demonstrated that precoder matrix is equal to eigenvectors equivalent by minimum eigenvalues of . Here new algorithm that minimizes leakage interfereence at receivers is proposed. In the next section we utilize another algorithm that have better performance at low SNR and is the same as PMINL algorithm, at high SNR regime. In the PMINL algorithm leakage interference at receivers is minimized to improve throughput of total system. But we do not consider power of desired signal at each receiver. In other words, we do not guarantee any power level for desired signals. This is because we do not consider direct channel in the process of precoder, decoder, and relay matrix design. Therefore, new optimization problem is introduced so the objective functions are SINR at receivers . Hereby, we can obtain desired signals at receivers by maximizing desired signal power and minimizing leakage interference. So, relays are designed for minimizing leakage interference and precoderdecoder matrices for maximizing desired signal power. Hence, by using relay we can weaken interferences and amplify the desired signals. 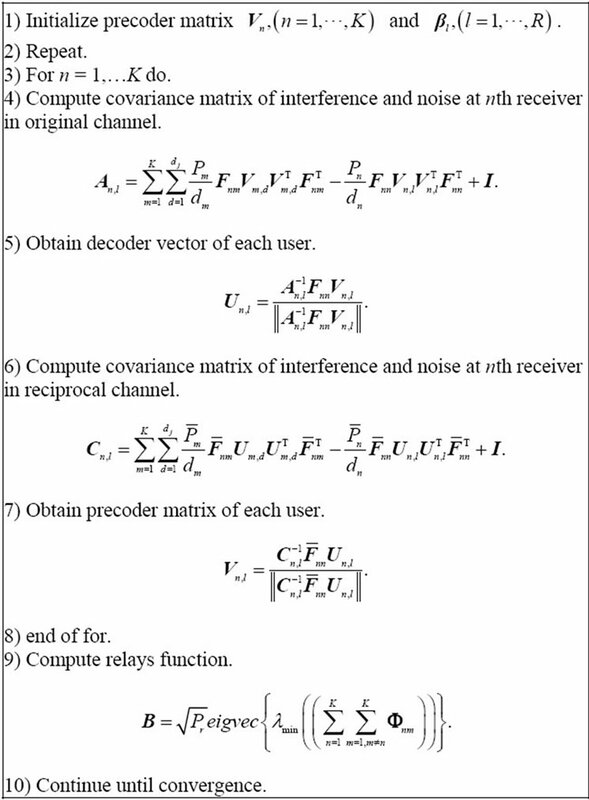 where is the covariance matrix of interference and noise at nth receiver due to the lth transmitted symbol. Similar to the previous algorithm, PMAXSINR algorithm is performed in three steps. Step 2: In this step, decoder and relay matrices are fixed. Then, precoder matrices are designed. In this section, the performance of proposed algorithms is evaluated and achieved average sum-rate is taken as a measure of the system performance. 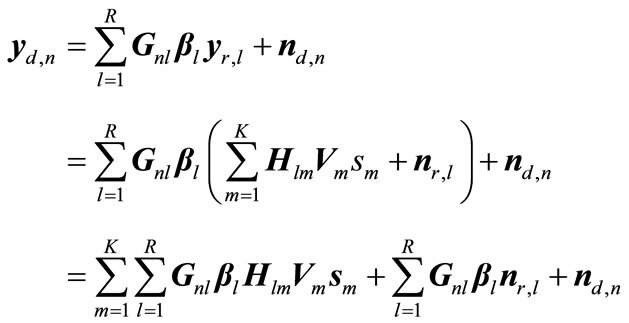 For numerical anaysis, we assume that each channel coefficient of MIMO channel matrices is supposed to follow independent and identically distributed (i.i.d) complex Gaussian distribution with zero mean and unit variance. The channels in two hop are quasi static and fix during one transmitted symbols. In Figure 2 we show appropriate performance of PMINL algorithm for two cases of with and without relays in which number of users and relays are equal to 3, number of antennas at each node are 4 and 2 data symbols are sent from each transmitter. Figure 3 indicates increasing performance of PMINL algorithm for different number of relays. 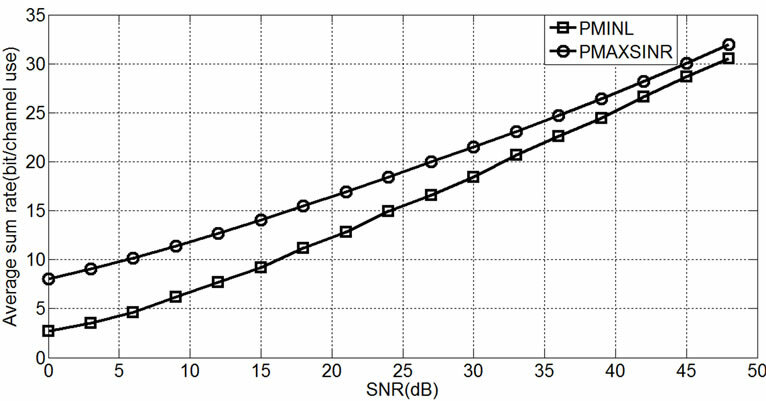 This figure implies that by increasing number of relays, average sum rate of network can be improved. Performance of proposed algorithm (PMAXSINR) is showed in Figure 4 for the both mentioned cases. Figure 5 indicates performance of PMAXSINR algorithm for several relays number. For comparison average sum rate of PMINL and PMAXSINR algorithms are sketched in Figure 6. Better performance of PMAXSINR algorithm is observed at low SNR regime. Note that at high SNR two algorithms have equal performance. Figure 2. PMINL algorithm for M = N = L = 4, K = R = 3, d = 2. Figure 3. 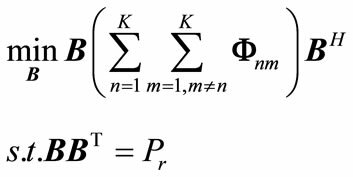 PMINL algorithm for M = N = 4, L = 5, K = 3, d = 4. Figure 4. PMAXSINR algorithm for M = N = L = 4, K = R = 3, d = 2. Figure 5. PMAXSINR algorithm for M = N = 4, L = 5, K = 3, d = 4. Figure 6. Comparison between PMINL and PMAXSINR algorithm for M = N = L = 4, K = 2, R = 3, d = 4. 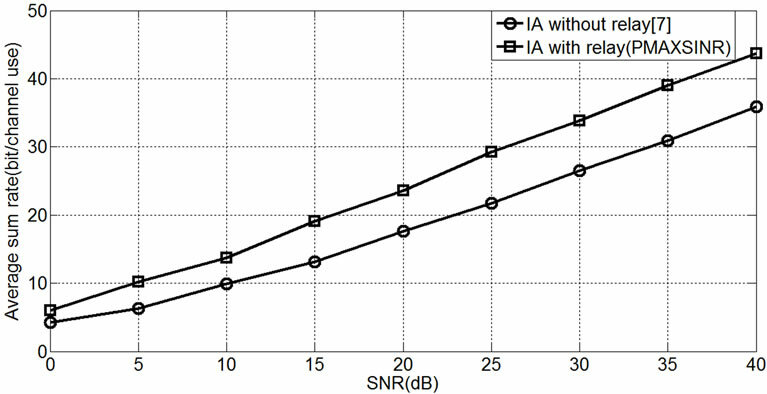 In this paper, full duplex AF relays are used for IA in interference channels and are showed that with relays can reach to K DOF of IC. Here an iterative numerical approach for Interference Alignment is developed in K user interference channels. Then, two altruistic algorithms for IA are proposed that both of them employ reciprocity property of channels. Unlike selfish approaches where each transmitter tries to maximize his own rate by trans mitting along those signaling dimensions where his desired receiver sees the least interference, we follow an unselfish approach where each transmitter primarily tries to minimize the interference to unintended receivers. In the first algorithm (PMINL) precoder, decoder matrices and relay functions are designed only for minimizing leakage interference at receivers. So, we must use an algorithm that does not diminish power of desired signals at receivers. Hence, PMAXSINR algorithm is proposed. In this algorithm we design precoder and decoder for maximizing power of desired signal. Then, relays function are designed for minimizing leakage interference at receivers.